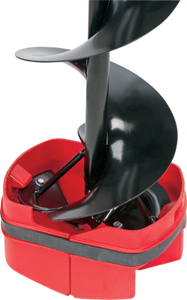 To Remove your Snap Cap, simply hold the auger upright with the weight down on the cover, and open with your foot. Lift out and you're done. Tested tough. Resistant to snow and ice build-up. Works with Strikemaster Lazer Mag 6,8, 9, and 10" augers, with or without the centering spike.